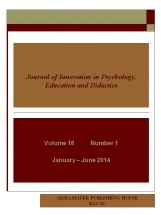 Journal of Innovation in Psychology, Education and Didactics is a bi-annual scientific journal edited by an Editorial Office from the specialization The Pedagogy of Primary and Preschool Education – “Vasile Alecsandri” University of Bacău. This journal is the follower of Studii şi Cercetări Ştiinţifice, Seria: Ştiinţe socio-umane (Studies and scientific research, Series: Social and Human Sciences) edited by the Department for Teacher Training, “Vasile Alecsandri” University of Bacău, since 1998. Historically, Studies and scientific research, Series: Social and Human Sciences had one issue per year, but from 2011 it appears two times a year. Since number 15/ 2011 the old name was replaced with: Journal of Innovation in Psychology, Education and Didactics – JIPED.